 In 2000, Judy Haynes and Nancy Reinisch teamed up to create the Roaring Fork Women’s Triathlon Team. For the next 18 years, they developed the program into Colorado’s premier women’s training program. Judy Haynes, a Certified Swim Coach and Personal Trainer and Nancy Reinisch, a clinical social worker and USAT Coach, offered women in the rural communities of Western Colorado the chance to learn the basics of swim, bike, and run/walking to complete their first triathlon. Their mission was to promote fitness, health, fun, and philanthropy in a supportive and cooperative environment—a win-win situation for women athletes. 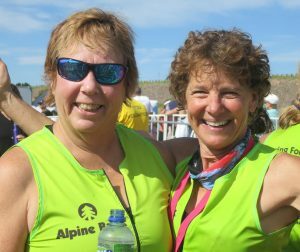 For almost two decades, Coach Nancy and Coach Judy supported women through the physical and emotional ups and downs of completing a sprint triathlon. 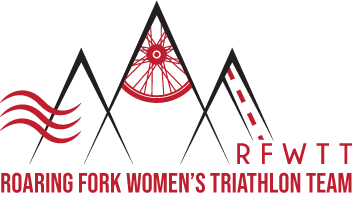 Many of the RFWTT member have gone on to complete Half Ironmans and Ironmans and just as many have remained with the team to continue to complete the annual sprint triathlon at the Tri for the Cure in Denver. In both cases, women learned to create a healthy lifestyle through triathlon. In 2016, Coach Nancy was awarded the USAT Multisport Spirit Award, for her work with promoting triathlon for women. During their years as Head Coaches, Coach Nancy and Judy were able to hire some of the best coaching assistants and staff in the valley. Many of the coaches were long term alumni of the program and included Coach Emeritus Maureen Nuckols (deceased 2017), Carol McCurry, Heidi Halladay, Carla Westerman, Katie Soden, Sharma Phillips, Kathy Westley, and Mary Jay. The program owes many thanks to these alumni staff, who in their own unique way were able to meet the needs of each and every ability level on the team. Unfortunately, in 2016 Coach Nancy was diagnosed for a second time with Stage IV, metastatic breast cancer. It was during this time that Coach Nancy and Coach Judy made the difficult decision to retire as Head Coaches and turn the administrative and coaching duties of the team over to alumni Carla Westerman, USAT Coach; and alumni Sharma Phillips, IronMan Coach.